Hi everyone! I am so excited to be your Growing In Unity gal this week! Welcome to the final day of this fabulous week - it sure has gone by fast. Be sure to leave comments on my GIU posts each day this week because at the end of this fun week, I get to choose TWO of you to win an awesome grab back of 25 Unity Stamps! So, I thought Wednesday's post was going to be my favorite from my GIU week, but I changed my mind. THIS one is AND it's my birthday - happy Friday the 13th everyone!!! Don't forget to leave those comments, it could be YOUR lucky day, too! I wish I had some pastel grounding medium or the pastel board like she worked on but I didn't so I just used the absorbent ground medium I do have and applied it on the the board with a palette knife to create more of a tooth for the pastels to grab on to. My process for creating this tiny mixed media board is quite long so I'm going to go step by step as I think that might make it easier to understand how it came together! 1. I picked out two teal colors and two green colors for my color palette and alternated scribbling them on the entire board blending them all together with my fingers. 2. I created a soft pencil outline of where the stamped image would be and took my palette knife to apply gesso around the edges of the board. Let dry completely. 4. I sprayed my board with some Helmar Workable Fixative so I could continue adding layers over the pastel pencils. 5. Using a blend of Faber-Castell gelatos and big pitt brush pens in red, I created the red shading around the flower image. 6. Using a fine tip Faber-Castell pitt pen, I outlined the image in black to make it stand out more. 7. I almost stopped at that point but I kept looking at it and thinking it needed something else...then it hit me, drippage and paint splatters of course! So, I took some LiquitexInk in magenta and dripped it on my board then tapped it vertically on my table to make the drippage. 8. Using a black gelato applied directly to the edges of the board, I blended with my fingers to frame everything. There, now it was complete! I sealed my canvas using Helmar Crystal Kote in a glossy finish. Here is a close up - ahhh, I just love all the ink splatters and this stamp is gorgeous! I will be using it over and over. I also can't wait to try this technique again on some surfaces actually primed for the pastel medium. I can't believe this week has reached its conclusion. I want to thank each and every one of you that stopped by and left me the most amazing comments. Each one made me smile as they came through - being a part of Growing In Unity is truly about uplifting each other and I hope you will all continue to follow along as a new GIU gal is introduced each week this year. Be sure to stop back by tomorrow to find out if you won either of the two grab bags of 25 Unity Stamps! Thanks so much for stopping by - if you liked my art work today and don't want to miss a post please be sure to follow me by clicking the button below! Let me be the first one to congratulate you on this beautiful mixed media piece!! Love everything about it!! Very nice. Thanks for all the inspiration this week. LOVE! This is a gorgeous piece!!! Love the image coloring and the drippage....oh the drippage ♥ FABULOUS!!! Wow, a true masterpiece work of art! Amazing! I have loved all you project this week and your great written tutorials. Thanks for sharing. WOW, this is fabulous. Lovely art on wood Carisa. Wonderful projects all week. I couldn't choose a favorite if I had to this week. Every piece you shared is truly beautiful. Wishing you a very happy Friday the 13th birthday and may your year be happy, healthy and full of creativity! Thanks for all the inspiration this week! Awesome project! This is beautiful and I love the sentiment, would be perfect for my daughter! Hope you have a wonderful birthday! Thanks for a great GIU week! Going to get that stamp this weekend!! Thanks for all the FAB inspiration for using it!! Wow! Gorgeous! You have the creative wheels in my mind turning! Wow! I've learned so many techniques during this week that I want to do all of them, but I'm going slowly because I'm new in this hobby. I really appreciate all your ideas and creativity Many blessings and happy birthday! Very cool! Love the colors in this and the quote too. I love drippyness and splatters too. Thanks for sharing. Awesome wrap up to the week! 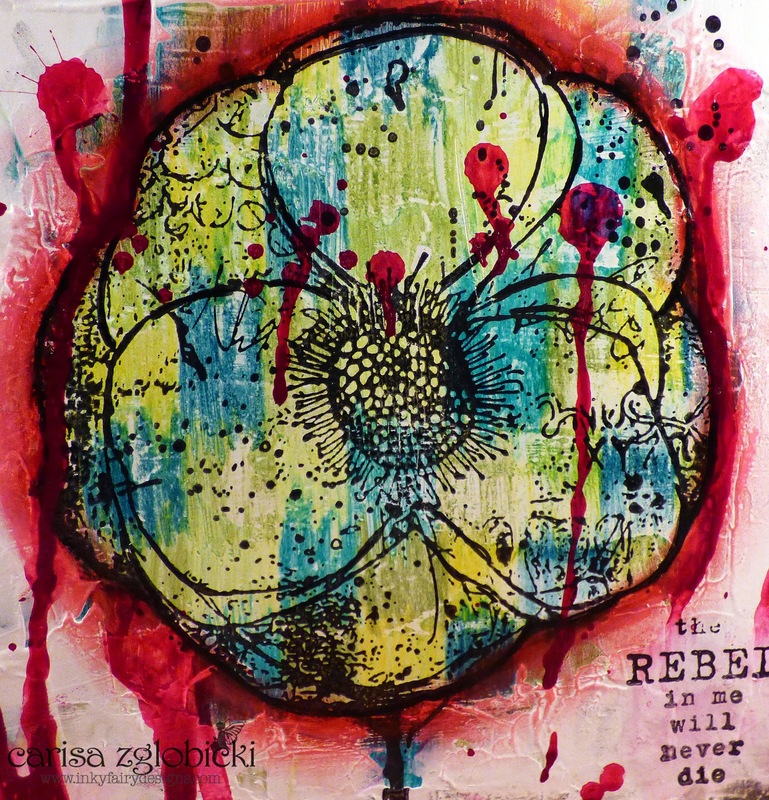 love this colorful mixed media piece! Pretty flower stamp! Happy Birthday to you also! It has been a great GIU week! You are very talented when it comes to color. I'm loving the blue/green/red combo. I never would have put them together, but they look great!!!!! Cool project. I enjoyed seeing your projects this week as GIU gal. Thanks for the inspiration. WOWZERS! 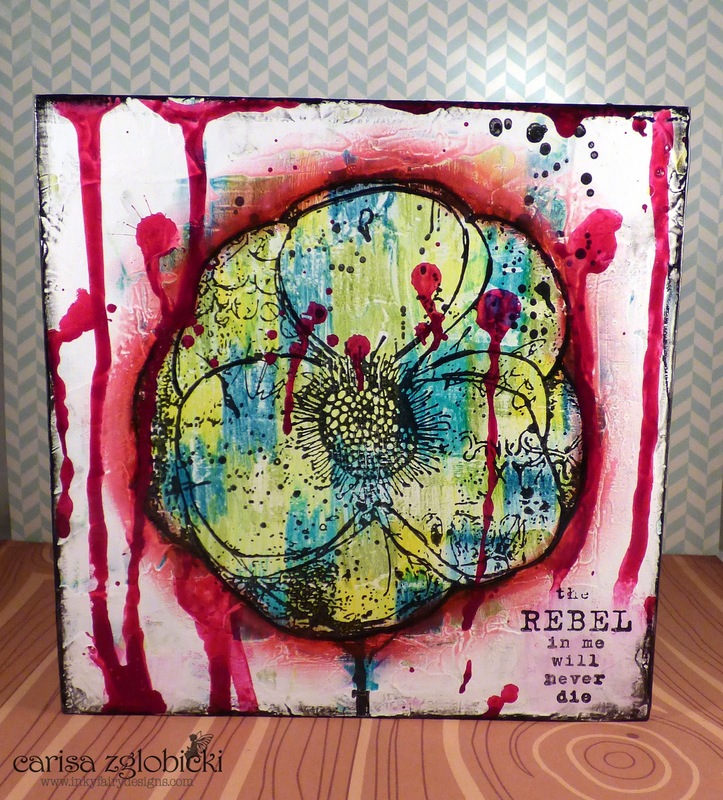 This is Gorgeous, love your mixed media flower! Bold and beautiful!!!! Fabulous mixed media project. What a wonderful stamp and terrific sentiment. Amazing work this week. Thanks for all the inspiration!!! Awesome project - love it!